"This is a two-loaf recipe. We often prepare this when taking a meal to another family so we can dine on the second loaf. Great with smashed potatoes and green beans or a nice broccoli salad. Can add cheese for extra moisture." Mix 1/4 cup tomato sauce, Worcestershire sauce, spicy mustard, and honey together in a bowl; set aside. Mix thoroughly ground beef, ground turkey, ground lamb, 2 1/4 cup tomato sauce, oats, egg, sweet onion, salt, and pepper in a large bowl; divide into halves and form 2 loaves. Put loaves into loaf pans. Bake in the preheated oven for 45 minutes, brush tops with sauce, and continue baking until no longer pink in the center, about 15 minutes more. An instant-read thermometer inserted into the center should read at least 160 degrees F (70 degrees C). Cool slightly in pans before serving. 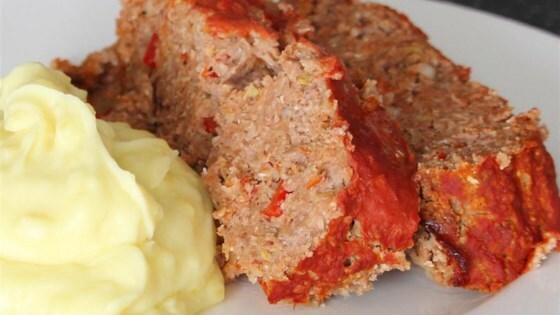 A juicy meat loaf filled with vegetables and glazed with a sweet and tangy sauce. Easy to make, great comfort food with mashed potatoes, applesauce and freshly cooked carrots. I love having the second loaf. Really, terrific recipe. The meatloaf was a very tasty centerpiece to mashed, new potatoes w/garlic and green beans sauteed with chopped pancetta and carmelized, roasted pecans. I omitted the lamb. Came out great!